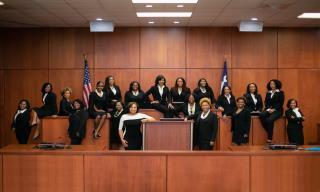 (Newser) – The most populous county in Texas got hit with some "black girl magic" on Tuesday—which is why you'll now see a whole bunch of proud female African-American judges on the bench going forward. While much of the nation was hyperfocused on another race in Texas—that of Beto O'Rourke and Ted Cruz for a US Senate seat—19 black women ran for judge in Harris County on Election Day, and all 19 of them emerged victorious, per the Guardian and BuzzFeed News. The women (dubbed the "Houston 19," per the BBC) all stumped together under the "Black Girl Magic" slogan, posing for a pre-election photo and spurring a hashtag of the same label. It's not about BLACK. The news focuses too much on that, as though they're constantly trying to say "Remember people, not everyone is the same! Hang on to the separation." Big trouble in little Africa.